Firewatch is the seat of Imperial power in the Telvannis District. Moreover, it is a symbol of Imperial might and culture in this most remote corner of Tamriel. Firewatch is entirely fortified, and features a very tall lighthouse, an impressive palace, and a rich library. 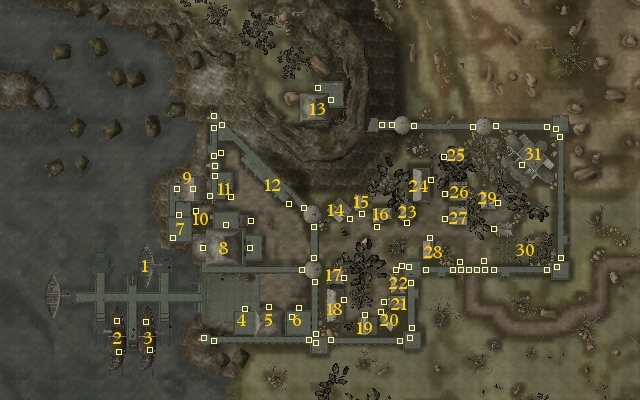 However, Firewatch is mostly a military zone, and the civilian part of the city is relatively small. The city itself is divided into three districts, each separated from the others by high walls and large gates that are closed at night. 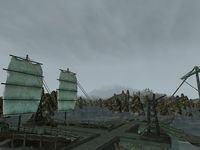 The southwestern part of the city, the port district features large docks, a chapel of Imperial Cult, and Census and Excise buildings. People who arrive, by boat or by Divine Intervention, in the Port District at night can head to the Silver Serpent, a boat converted into an inn, to rest until the morning. 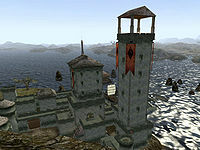 Just north of the Port District, the Palace District houses not just the palace proper, but also the lighthouse, the local prison, the guilds of Fighters and Mages, an Argonian Mission, and the garrison. The Palace District links together the Port District and the Town District. 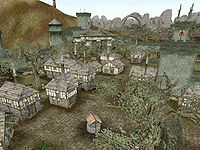 The eastern part of the city holds a little town, where various merchants and the library can be found. The Town District is where Firewatch opens herself to the mainland, with the Southern and the Northern Gates. Although Firewatch's fortifications are impressive, if it were to fall to attackers, the Hill Bastion is where the defenders would retreat for their last stand. Outside of Levitation magic, the only way in is either by climbing steep cliff walls or going through the city walls. Both doorways are easily defended by archers from the Bastion. The Duchess Perulia Jandacia holds seat in the massive tower of the Firewatch Palace. The local garrison is led by Herdonia Varan and the bastion soldiers are under Timeo Callonus's command; both report to Imperial Knight Senillos Tulnus. Champion Darnell oversees the formation of new Imperial Legion recruits. Within the Palace, Walks-Through-Shadow heads the local Argonian Mission, Galan Brandt and Gindaman are the stewards for the Guilds of Fighters and Mages respectively. Ladia Tunifus is the senior cleric at the Imperial Chapel, and should not be confused with her relative Vaselius Tunifus, the prison warden. Jeande Beluel does the Census and Excise paperwork. In the Town district, the local boss of the Thieves Guild, Silniel the Maven, can be found in the Howling Noose tavern. For a complete list, see People in Firewatch. From Vvardenfell, the quickest way to the city is to use a Divine Intervention spell or scroll while around Tel Mora. Shipmasters offer travel lines with Bal Oyra, Helnim and Tel Ouada. A road leads east, then north, to the Boethian Mountains, where it forks northwards to Bal Oyra and southeastwards to Ranyon-ruhn and Llothanis through a canyon. If one travels along the sandy hills on the coast south of Firewatch, a small trail leading to Tel Oren can be found. The northern gate leads to untamed wilderness. Effe-Tai in Mournhold can transport you to Firewatch palace. The Velothi tower of Nassudan lies in the wilderness north of Firewatch. The Murahn-Cithal Iron Mine is found just near the place where the road from the South Gate turns towards the north. Three caverns, Odimasadra, Pahunsabi and Sanammasour, are nearby. Coladia Nelus' Stalker: Get rid of a stalker who has been bothering a resident of Firewatch. Muscle Green-Eyes: Adjust the ethics of an apothecary in town. The Running of the Bullies: Protect an upright citizen from a few bullies. A Spy in Firewatch: Get rid of Vaneris Theneria, the Telvanni spy. Black Roses for Banviris: A rose by any other name won't do for a guild alchemist. Herne's Soul: What was thought to be impossible now needs to be delivered. Stopping the Thieves Guild: End the career of a thief to intimidate the Thieves Guild. Theft of Herne's Soul: Retrieve this unique magical artifact from the Thieves Guild. A Friendly Warning: Deliver a message to the Imperial Cult in Firewatch. Cyrodiilic Brandy: Rid the other tavern in Firewatch of its booze. Herne's Soul: Steal a powerful artifact from the Mages Guild. A Clannfear in Firewatch: Help an exasperated Bosmer shake off a suitor's unwanted expressions of affection. Gummidge: An old commoner has lost something... but what exactly? Highway Robbery: Raiders are attacking caravans near Firewatch. Running Into Trouble: Two slaves are in peril after they escaped from the Orelu Plantation, get them to safety. 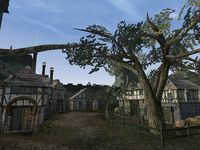 The Dwemer Staff: Recently a dwemer ruin was discovered close to Ashamul and the cave-dwellers want a piece of its treasures. The Price of Wickwheat: Discover who sells the cheapest vegetable. This page was last modified on 17 March 2019, at 02:39.